Eon NRG recorded $929,000 in sales revenue for October on the back of rising gas prices. Oil and gas producer Eon NRG (ASX: E2E) impressed investors this morning with news it had achieved record sales revenue of almost $1 million during October, which is the company’s highest with its currents assets. During October, Eon NRG took advantage of the soaring natural gas prices, which have rocketed around 66% in the last two months from a low of US$2.40 per thousand cubic feet to hovering above US$4.00/Mfc. According to the company, the average CIG Rockies gas price languished around US$2.40/Mcf the previous six months. Natural gas prices over the past 12 months. Underpinned by the rising gas price, Eon NRG reported sales revenue of US$660,000 ($929,000) for October, with 33% of that coming from its natural gas production from the Silvertip Field in Wyoming in the US. The company’s Silvertip Field gas is delivered to nearby interstate transportation pipelines and sold at the CIG Rockies benchmark price. Eon NRG sold 4,500 barrels of oil equivalent for an average price of US$3.39 per Mcf. The remaining 66% of sales revenue was from 9,260 barrels of oil and NGL and attracted an average oil price of US$69/bbl. With gas stockpiles at a 15-year seasonal low, Eon NRG anticipates the prices increases may remain due to a looming shortage to meet winter heating needs in the US. This is despite near record gas production, which has risen as a result of shale oil output. 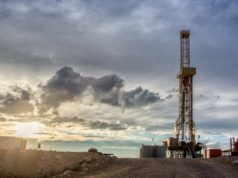 Eon NRG’s gas production form Silvertip Field has been stable this year, following the company’s successful recompletion of the 35-28 well in February. As gas prices are expected to remain high throughout the US winter months, the company expects to carry out another well recompletion next month, this time at the ST 64-28F well where infrastructure to capture and transport the gas already in place. Gas from this well will be processed through Eon NRG’s plant and delivered directly to the purchaser’s pipeline. Eon NRG other assets include Borie in Wyoming, Sheep Springs and Round Mountain in California, and recently pegged acreage in Converse Country and in the Powder River Basin, which are also in Wyoming. During the September 2019 quarter, Eon NRG generated US$332,000 in positive cash flow and is now prioritising drill targets to evaluate next year through an “aggressive” drilling campaign. This morning’s news pushed Eon NRG’s share price up more than 433% to reach $0.032.